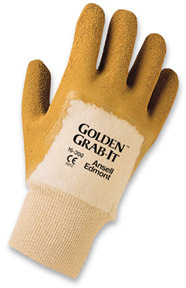 Golden Grab-It II gloves are the most cut-resistant, comfortable and cost-effective gloves of their kind on the market. Their soft knit jersey lining provides superior comfort and flexibility compared to the ordinary flannel of competitive gloves, and their premium-grade natural rubber crinkle finish coating offers exceptional cut resistance and long service life. Sharp edges roll over the surface texture instead of cutting into the glove. Applications: Handling sharp-edged materials like glass, scrap metal, and sheet metal • Handling abrasive or sharp-edged building materials like concrete block, tile, and lumber. Caution: This product contains natural rubber latex which may cause allergic reactions in some individuals.